Ideally located in the heart of the city, this hotel puts you within easy proximity of some of London’s most captivating landmarks including Hyde Park, Buckingham Palace and Marble Arch as well as shopping on Oxford Street. 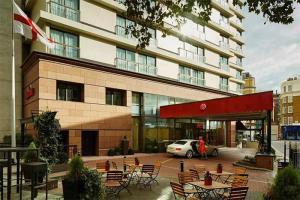 The hotel is just a short walk from the Marble Arch and Edgeware Road tube stations. Renovated rooms and suites offer a stylish retreat, while amenities such as Apple TV technology and high-speed Wi-Fi help keep you connected and entertained. The hotel is well connected to Heathrow airport, with the Heathrow Express at Paddington Station just a mile away. The hotel is approximately 17 miles from Heathrow Airport. The Heathrow Express arrives at Paddington Station, about a mile from the hotel. Nearest tube stations are Edgeware Road and Marble Arch.